And another former member, or two, found!!!! Thanks again to everyone who has contributed to the Website which, along with savings from a recent change of the Hosting Company, means that its existence over the next couple of years or so is now assured. Both the ‘Domain’ name and hosting for the website are now with a single company and the contract is a deal better than what the original ‘hosts’ were looking to charge at renewal. This has brought our overall running costs down to around £170 a year – albeit that we will need to see what next year brings as many of the hosting companies seem to offer a good deal in year one – then tend to get more expensive thereafter – so we will wait to see! However, the good news is that the Standing Orders we have received will meet this present cost and, of course, we also have some remaining capital from the Re-Union donations and the subsequent circulation of former members. As with earlier additions and updates you will, in most cases, find that these are highlighted in the website with a ‘NEW’ Icon. Thanks to Lesley Tyson’s (Nee Morris) Facebook posts, the additions also include several ‘new’ photographs from the 1977 production of ‘Mother Goose’ – our final pantomime! The scope of the ‘Memories’ Page has been widened and additions have been added about a number of the former members whom we have sadly lost over the past year or two. We hope that these short pieces will serve as a reminder of both their involvement in the Drama Club and our friendship with them. MDC – MINI RE-UNION – ESSEX BRANCH! Given that the meetings of the Website Group usually make sure that ‘business’ is combined with pleasure and that several other former MDC members live within a short distance of whichever Essex Hotel is chosen as a venue, the latter were invited to join the July meeting – with their ‘suggested’ arrival aimed at the same time as when the second round of drinks would need to be ordered – all non-alcoholic of course! The ‘business’ bit of the meeting was, in fact, finished in record time and so a very pleasant afternoon was spent catching up with one another and, of course, reminiscing about the MDC days – especially about some of the regular pantomime mishaps! 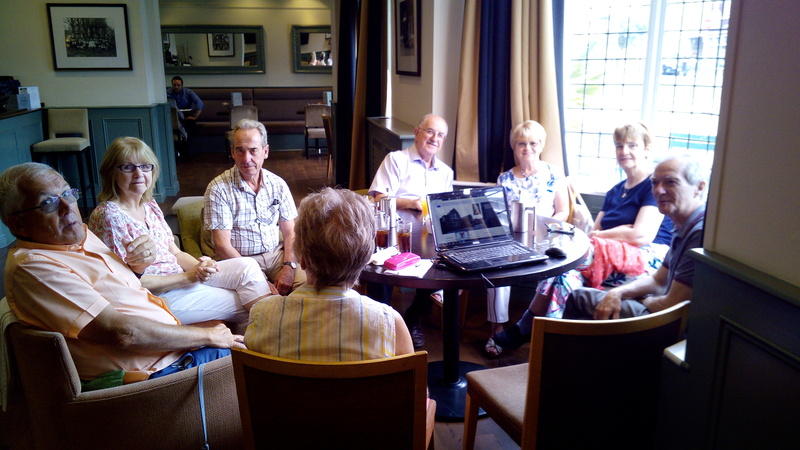 As the photograph shows, Jenny, Malcolm, Val and Iris managed to swell the ranks at the County Hotel, Chelmsford – along with Peter via his ‘every other meeting’ eight hour round trip from Gloucester to make sure we keep the accounts in order!!!! The empty chair had been vacated by John whilst in photographer mode. June (back on) is alongside Denis – trying to interpret his expression! Unfortunately other ‘locals’ – Norma, Sue (A), Sandra, Pete & Maggie – could not make it on this occasion – but hopefully will next time! The photograph is now on the website in the Markhouse Page – Members Gallery. As the majority of the recent website additions have come from the Guardian Archives, it seemed an appropriate time to add some comment on this rich source of information about our youth and how it can be accessed at the British Library- just in case any former MDC members fancy a nostalgic visit at some time! 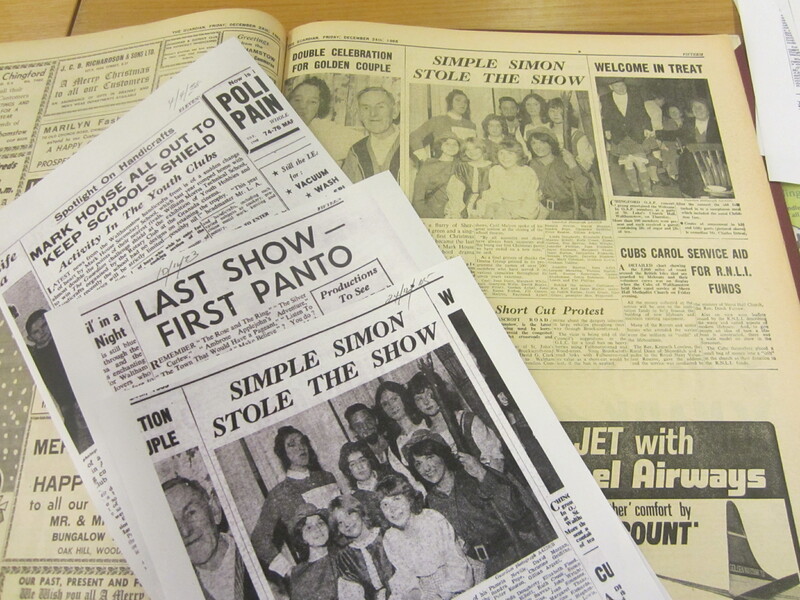 Although the MDC items are usually found in the ‘Leisure/Drama Section’ of each edition, other items inevitably catch the eye and several other ‘non Drama Club’ reports and photographs, relating to former members, have regularly been stumbled upon. Whilst this have not all been placed on the website, the items have, in most cases, been copied and forwarded on ‘to whom it may concern’ – in the hope that these may still be of interest. These reports have mainly been found in the early 1950’s/1960’s editions and it does seem that the Guardian had a really positive ‘community based’ focus in its reporting in this period; especially in relation to schools and youth groups. In the latter respect it has been staggering to see just how much our ‘hosts’, the Marsh Street Youth Centre’, offered its members with trips abroad, a wide range of sports and Vocational classes – plus, of course, many creative activities within the performing arts – including MDC! These archives are certainly worth a look if you are interested in Social History and how Walthamstow and its community fared at the time of our youth – plus the way these articles, adverts and reports were presented in those days – just look at the prices of cars and houses in those days! In addition to these archives, you can also visit the British Library just to see the wide and varying range of exhibitions they stage. These, in most cases, are free to enter and you don’t need to register for a Reader’s Card for this part of their work – just turn up! Whilst there has only been a limited response to the circulation about the remaining CMMF funds, we hope that at least one of these will lead to another Performing Arts Project – BUT – in the meantime we are still looking for more former members to provide a link to someone, either in their family, or in a group with whom they are involved, to provide the necessary ‘link’ to enable us to put this funding to such good use. So – if you have any thoughts, however tentative, then please get in touch with Dave on 0208.657.6327 or dm2013cmmf@googlemail.com for further info and/or a chat – with no strings, or ‘work’ attached!!! ‘NEW’ FORMER MEMBERS FOUND – But the search goes on! Recent posts on the ‘Walthamstow’’ Facebook pages – ‘admitting’ that their schooldays were spent at Mark House, has led to contact with former member Dorothy Austin (now Dorothy Tinnams) and information that Maureen Kerwin now lives in Australia. Dorothy has promised to search her loft (for memorabilia) in due course and we hope to hear back from Maureen shortly. In the meantime there are still a good number of ‘well established former members ’still in hiding’ – so the search goes on! Although you have probably received more than enough emails about Data Protection over the past months, we thought that it would still be appropriate to reconfirm, at this time, the MDC policy and arrangements on this subject. In this respect the only personal information that the website contains and shows is the names of former Markhouse Drama Club Members. Contact details, where known, are held outside of the website and will only be released to other known former MDC members with the agreement of those whose information is sought.